I remember when we first heard about the abc treatments for multiple sclerosis. This is the name given to three of the earliest FDA approved immunomodulating drugs for treating multiple sclerosis. It was exciting (at least I thought so). "Which one of the abc drugs are you using?" Cir would answer, telling them which treatment he was using at the time. It was the MS "in" thing to do. And Cir's doctors encouraged him to at least consider taking one of them. According to the studies, each one of the abc treatments is shown to decrease the number of relapses or lessen the effects of MS symptoms. The "A" of the ABC treatments for multiple sclerosis is avonex or interferon beta-1a. I always thought the beta part was interesting. Avonex is a once-a-week injection medication given intramuscularly (injected into the muscle). It is used to treat the relapsing forms of multiple sclerosis. The "B" of the ABC treatments is betaseron. Betaseron or interferon beta-1b - there goes that beta thing again - is also an injection that is taken 3 times a week. It is given subcutaneously (injected just below the skin). It treats the relapsing forms of MS also. This includes secondary-progressive MS where there are sometimes relapses. Last but not least is "C". 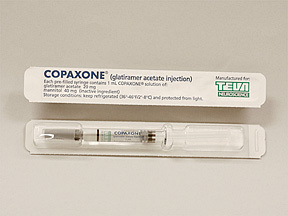 Copaxone or glatiramer acetate, is the third of the ABC treatments for multiple sclerosis. It is an injection taken once daily. Like Betaseron, it is given subcutaneously. Cir has tried each one of the ABC drugs. He stayed with copaxone the longest. He would try one of the interferons, but would end up back on the copaxone. It had the least side-effects. Even though copaxone has to be taken everyday, he could handle that better than having to deal with the side-effects of the interferons. We know several people who can take the interferons with no problem. They enjoy the freedom of the once a week avonex injection or the three times per week betaseron injections. Their bodies are able to tolerate the interferons. The side-effects either go away in time or they can put up with them better than Cir could. To read about Cir's experience with Avonex click here. What are your MS Medicines? What Medicines Did You Use First? How Many Do You Use Now? Add a list of the MS Medicines you use. If you can remember them in the order you started using them, then great. If not, that's alright too. Your experiences with them may help others in determining whether or not they should ask their doctor about them. Share your list of medicines right here! Want to See What MS Medicines Other Visitors Have Taken? Go from ABC Treatments Multiple Sclerosis back to MS Medicines.